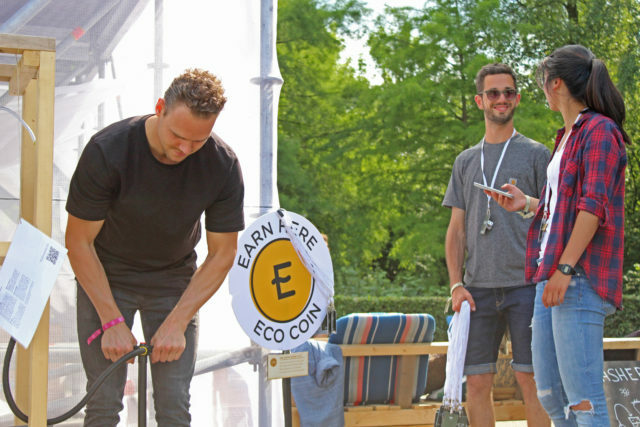 Last weekend the ECO coin ran its second living lab at Welcome to the Village festival. We wanted to experiment with making our new sustainable currency more social and test the new ECO coin payment system. We had some great weather and a fantastically curious audience who wanted to find out more about how they could earn their first ECO coin and join the sustainable economy. For this second living lab, the team developed a simple and strong payment system in the form of a website application that volunteers used to give or receive ECOs and a V.E.P (very ecological person for those in the know) card that was used as a wallet where festival goers ECOs could be stored. These wallets become highly desirable badges of honour at the festival and let other ECO users identify one another. 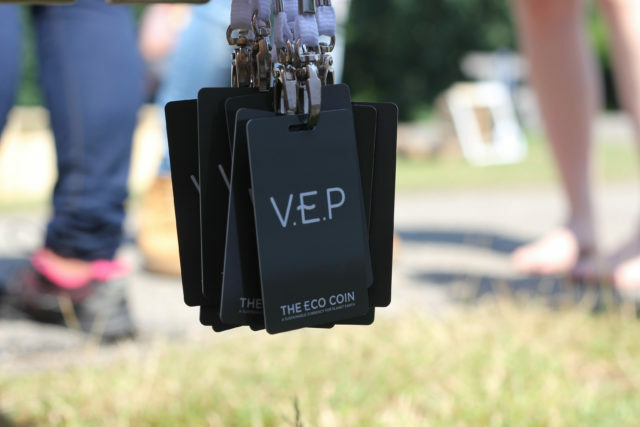 Festival visitors become V.E.Ps after they earn their first ECO coin. No training needed for the new "Point of Earn" and "Point of Spend" machines. 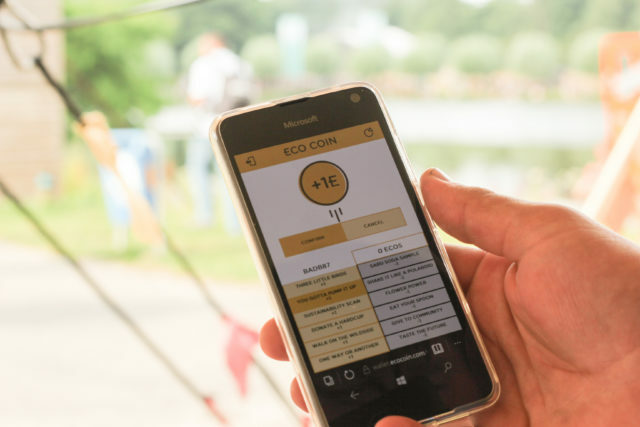 The ECO coin application was made so that volunteers could easily top up these V.E.P cards (much like how you might use a travel card) by scanning their cards and selecting how a festival goer earned or spent their coins. 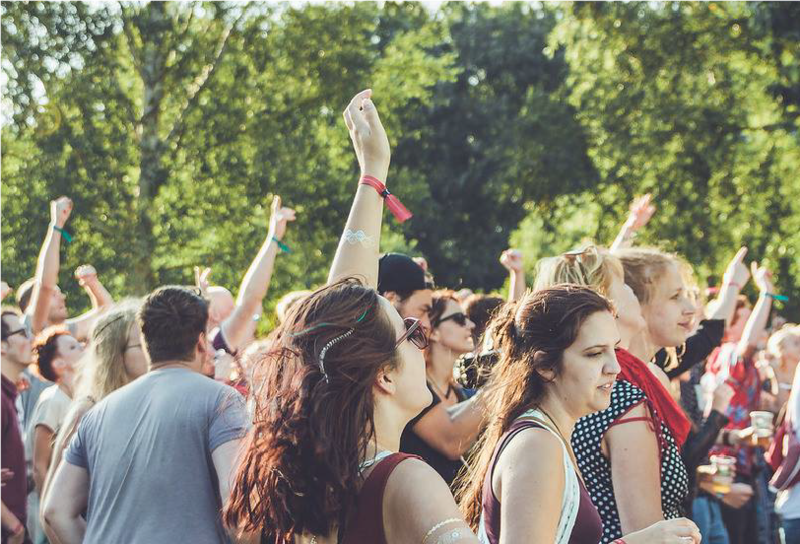 Festival goers could also see their balance and past transactions by visiting and entering their unique ID. You gotta pump it up! A popular earning spot for ECOs at the circular hair washing district. 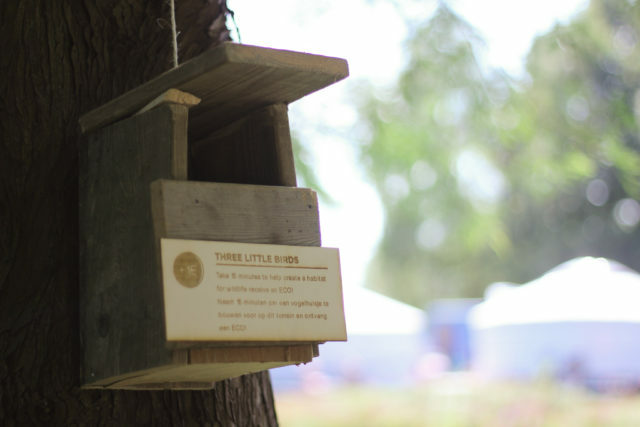 A birdhouse built from "waste materials", and yes we tweeted about it! 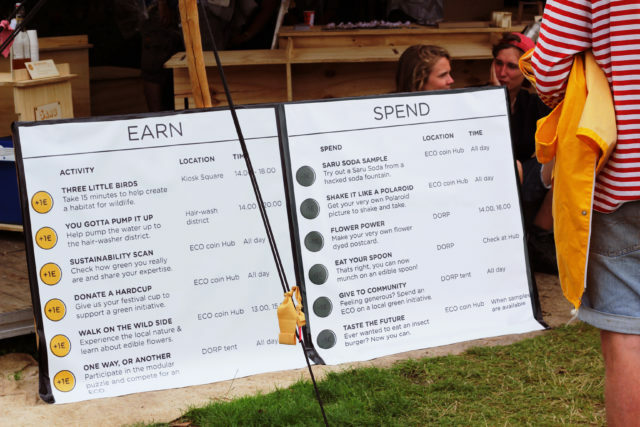 During Welcome to the Village festival there were six ways to earn, ranging from building a birdhouse out of scrap building material used for one of the festival stages to helping pump water up to a circular hair washing district from Japanese artist Sachi Myachi. 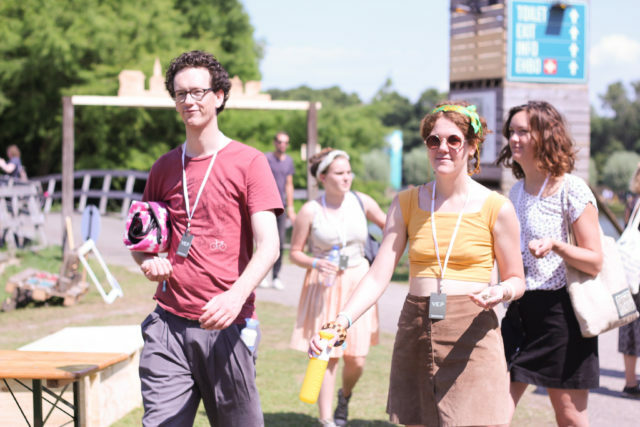 NNN was helpfully supported by an ambitious set of volunteers with an array of backgrounds (from psychologists to computer scientists and economists) who also helped making sure the ways in which festival goers could earn and spend their ECOs fit within the festival and community. Visitors going for a nature walk to plant edible flowers for next years festival. All of this sustainable action was encouraged by the array of rewards on offer: polaroid pictures were popular with kids and adults alike, you could try an edible spoon or even sample one of the many food futures in an insect burger which went down a treat with a cold beer. We also wanted to see how generous the festival crowd was, so people also had the option to donate their ECOs to a community reward in the form of solar panels. Research was carried out on finding out people's motivation to take part, which we will also share soon. 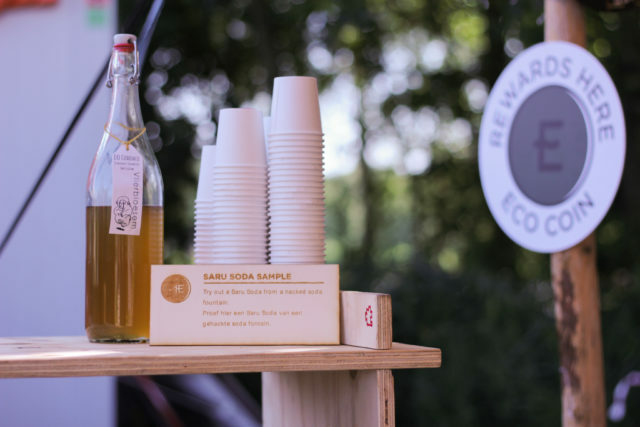 Saru Soda hacks post mix machines and takes on Coca Cola with their delicious and eco-minded Elderflower Cordial. 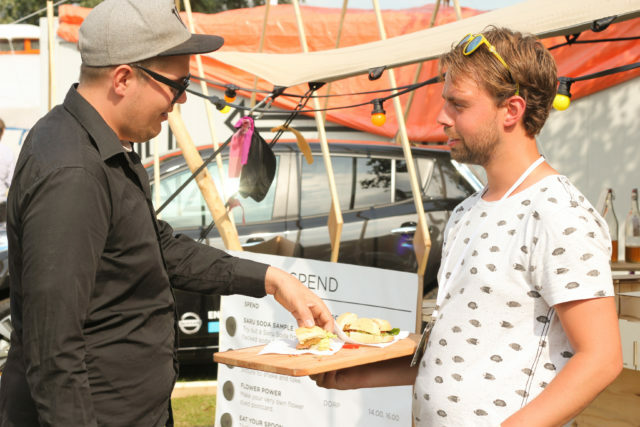 A visitor sampling the future of food: an insect burger.